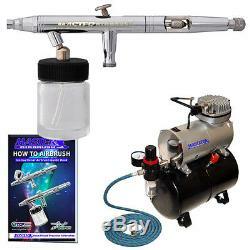 Master Hi-Flow S62 Airbrush Kit with Master Compressor TC-20T & Air Hose. 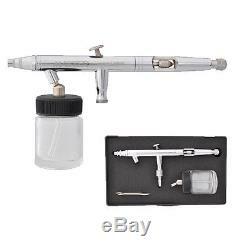 Multi-Purpose Precision Dual-Action Siphon Feed Airbrush! High Performance Airbrush that can be used for the Full Spectrum of. High-Performance Tank Compressor - Maintenance Free Oilless Quiet. Our Most Popular Air Compressor! Master Airbrush Model S62 Airbrushing System with Model TC-20T Air Compressor with Air Storage Tank. Master Airbrush Model S62 Airbrush Set. Professional Master HI-FLOW All-Purpose Precision Dual-Action Siphon Feed Airbrush with a 0.5 mm Needle & Nozzle and a 3/4 oz. Sprays light to heavy viscosity paint materials while providing high paint flow with a varying spray pattern. Great for: fine art, nail art, temporary tattoos, cake decorating, hobbies, crafts, auto and motorcycle graphics & more! 6 Foot Braided Airbrush Air Hose. Master Airbrush Model TC-20T Air Compressor with Air Storage Tank. Compressor Provides "Air-On-Demand" and the Air Storage Tank allows it to be Delivered with Constant Pressure & Zero Pulsation. Suitable for: Hobbies, Crafts, Nail Art, Auto Graphics, Temporary Tattoos, Tanning, Cake Decorating, Etc.. Supports Airbrushing for Most: Airbrush Types, Applications, Paint and Color Media, Levels of Users from Beginner to Advanced Artists. Sprays Light to Heavy Viscosity Paint Materials while providing High Paint Flow. User Friendly with a Broad Spray Pattern from Finelines to 2. Cutaway Handle allows for Quick Cleaning & Flushing for Increased Airbrush Production! Can be used for Most Airbrush Applications with Most Paint and Color Media. Details on individual items that come with this system below. Master Airbrush Model S62 Multi-Purpose Precision Dual-Action Siphon Feed Airbrush (Features a Self-Centering Drop-in Nozzle) Our Best All-Purpose Airbrush! Sprays Light to Heavy Viscosity Paint Materials! Sprays Varied Pattern with Very High Paint Flow! Nail Art, T-Shirts Temporary Tattoos, Cake Decorating, Hobbies, Crafts, Auto-Motorcycle Graphics & More! 0.5 mm Needle/Nozzle with a Broad Spray Pattern from Fineline to 2 Wide Siphon Feed Fluid Bottle: 3/4 oz. (22 cc) Cutaway Handle allows for quick cleaning and flushing for increased airbrush production! Beginner to Advanced Artists Most Usage Applications and Paint Spray Media High Production Spray Environments due to the Airbrushes Balance & Comfortable Feel. Dual-Action Trigger Air/Fluid Control Internal Mix Fully Atomized Spray Pattern Siphon Feed Fluid Bottle: 3/4 oz. (22 cc) 0.5 mm Needle/Nozzle Spray Pattern: Fineline to 2 Wide 15-50 PSI Working Pressure. Illustration Fine, Commercial Art Photo Retouching Custom Automotive Motorcycle Graphics T-Shirts , Textiles. Nail Art, Cosmetics Temporary Tattoos Signs, Backgrounds Models, RC's, Trains Hobbys, Crafts, Students Cake Decorating. Watercolors Acrylics Inks and Dyes Automotive Urethanes Lacquers Enamels. Made with High Quality Precision Components that enable this airbrush to work efficiently while providing exceptional atomization and accurate spray control. Features a Self-Centering Drop-in Nozzle for perfect alignment and even control through the spray range. Sprays Light to Heavy Viscosity Paint Materials while providing high paint flow with a varied spray pattern. Excellent for High Production Spray Environments due to it's Comfortable Feel and Cutaway Handle that allows you to quickly flush and clean passageways by grabing the needle chucking nut. Ideal for applications that require quick color changes with large or small amounts of fluid for detail to background spraying. The Solvent Resistant PTFE Needle Packing prolongs the airbrushes life; enables you to use of Solvent Based Automotive Paints: Urethanes, Lacquers and Enamel s. Fluid Control Knob for easy adjustment and control of paint flow. Removing the Needle and Nozzle Caps enable you to spray the full range of texture and stippling effects. All Parts Stocked for this Airbrush. 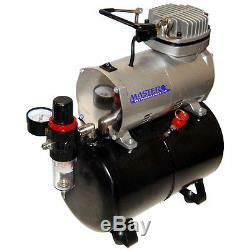 High Performance Airbrush Air Compressor with Air Storage Tank. Includes Air Pressure Regulator w/Gauge & Water Trap Filter. (Maintenance Free, Oil-less & Quiet). Provides "Air-On-Demand" and the Air Storage Tank allows it to be Delivered with Constant Pressure & Zero Pulsation! Hobbies, Crafts, Nail Art, Auto Graphics Temporary Tattoos, Tanning, Cake Decorating, Etc.. Powerful: 1/5 hp , Delivers a High Air Volume (0.8 CFM) and 25 l/m of Airflow. Portable: Light-Weight and Compact and includes a Carrying Handle. Precise: True Diaphragm Air Pressure Regulator with Gauge and Filter for Dry Air with Precise Airflow Control. This Compressor Supports Airbrushing for Most. Levels of Users from Beginner to Advanced Artists. Powerful: At 1/5 Horsepower this unit delivers more Air Volume (CFM) and Air Pressure (PSI) than any airbrush demands. Portable: Light-Weight, Compact and Easy to Carry with the Built in Handle. Precise Air Adjustment: True Diaphragm Pressure Regulator with Gauge and Water Trap Filter that provides precise adjustment of airflow and will ensure clean, dry air. Automatic On/Off Shutoff: Preset for automatic turn off when air tank reaches 60 PSI. Preset for automatic turn on when air tank pressure is below 30 PSI. This enables a longer compressor life from less motor wear and heat-related moisture. Constant Pressure and Zero Pulsation: Air is drawn from the large air storage tank providing you a constant regulated pressure. There's zero pulsation because air is drawn from the tank which eliminates any pulsation effect from the pistons. "Air-On-Demand": Designed to work only when you do, produces air on demand at your regulated pressure. Thermally Protected: Automatically turns itself off if the unit becomes over heated. Maintenance Free: Oil-less Piston Motor. Low Noise: Very Quiet Operation, only 59 db. Type: Single Cylinder Piston with 0.92 Gallon (3.5 Liters) Air Tank. MASTER AIRBRUSHES, AIRBRUSH SYSTEMS, PARTS & ACCESSORIES, PAINTS, and MORE. MASTER Airbrushes and AirBrushDepot Ccompressor Systems. Airbrush Learning Center - DVD's and Books. We are an Authorized dealer for all product lines that we sell. All Items we sell are brand new. If you wish to change an order or make an address change, it is best to call our customer service department immediately. If you have questions on how to do this, please message us first. Some of our locations are simply remote facilities and we do not have the ability to contact anyone there. We will always make your order right. All of our electronic items are rated for. It is the customer's responsibility for knowing the correct voltage requirement of their country. We reserve the right to select best option. UPS cannot deliver to P. Tracking information will be emailed once your items ships. UPS Ground is used within the lower 48 US States and Canada. If you select this option, be advised that if package is lost, stolen, or damaged, no claims can be filed. Paint Products and DVD's are excluded from this guarantee. Send back your return with a copy of the original order. Please allow up to 2 weeks for your return to be processed once it is received in our warehouse. Specific Product Return Exceptions: DVD's are non returnable. If defective or damaged they will only be replaced. Flammable or Hazardous Paint items: We must have picture documentation of damage sent or emailed to us on all paint related items in order to authorize a RGA number. This listing is currently undergoing maintenance, we apologise for any inconvenience caused. Add a map to your own listings. The item "Master S62 0.5mm Siphon Feed Dual-Action Airbrush Set Kit Air Compressor with Tank" is in sale since Thursday, January 9, 2014. This item is in the category "Crafts\Art Supplies\Painting Supplies\Airbrushing Supplies\Systems & Sets".